A2 Hosting announced Windows Hosting for those who prefer Plesk over cPanel, run CMS or e-commerce sites on ASP.NET, use MSSQL or just need the .NET framework. What? — the company famed for ease of use, screaming fast servers and friendly customer service has sold it’s soul (at least partly) to Microsoft. I’ve put together all the details to help choose the right hosting plan! 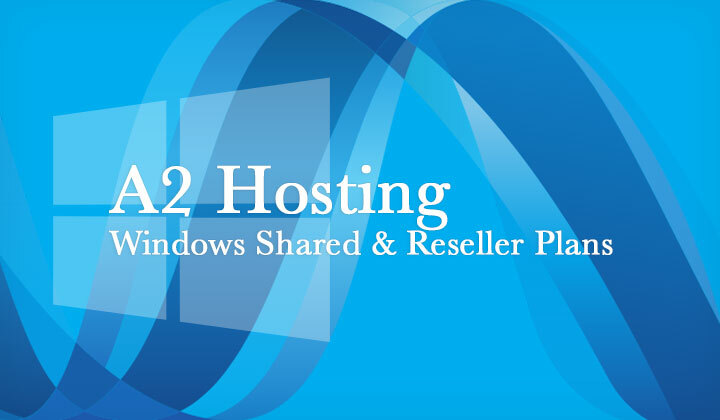 A2Hosting has two types of Windows hosting products; hosted on their self-owned high tech data center in Michigan USA. Each server is connected to a 10 Gb/s redundant, stable network with a 99.9% uptime guarantee. For shared hosting, you can choose the Lite Plan for basic individual sites, Swift Plan for multiple and Turbo if you want a high speed website optimized for conversions and your business (recommended for WordPress). With Reseller, there are four levels depending on how many accounts, storage and bandwidth is needed. Lite Plan – from 4.90/m: 1 Website, 5 Databases, Unlimited Storage, Unlimited Transfer, Plesk Control Panel, SSD Storage, Free SSL. Swift Plan – from 5.88/m: Unlimited Websites, Unlimited Databases, Unlimited Storage, Unlimited Transfer, Plesk Control Panel, SSD Storage, Free SSL. Turbo Plan – from 10.78/m: Unlimited Websites, Unlimited Databases, Unlimited Storage, Unlimited Transfer, Turbo “Up To 20X Faster”, A2 Site Accelerator, Plesk Control Panel, SSD Storage, Free SSL. Silver – from 19.79/m: 75 GB Storage, 600 GB Transfer, 60 Accounts, SSD Storage, Free SSL, Plesk Control Panel, eNom Reseller Account, WHMCS. Gold – from 25.73/m: 150 GB Storage, 1000 GB Transfer, 80 Accounts, SSD Storage, Free SSL, Plesk Control Panel, eNom Reseller Account, WHMCS. Platinum – from 42.23/m: 200 GB Storage, 2000 GB Transfer, 100 Accounts, SSD Storage, Free SSL, Plesk Control Panel, eNom Reseller Account, WHMCS. A2 Hosting with Windows available in 2019. A2 Hosting’s Windows hosting is up to bar in performance with regular Linux hosting. The difference is in the software infrastructure, however the environment is very flexible and is suitable for pretty much any kinds of set-ups. For example you can effectively run a WordPress blog with Windows hosting although some other online applications only work using Microsoft’s website hosting components. Many popular CMS and eCommerce platforms such as nopCommerce, DotNetNuke, Umbraco, Sitefinity, Kentico depend on the web application framework ASP.NET. Microsoft’s environment provides a variety of popular hosting solutions such as .NET framework, Microsoft SQL Server (MSSQL), Windows Server, ASP.NET, Access Database, Classic ASP, MVC and Silverlight. Also traditional MySQL & PHP are supported for those who need it! While some simply prefer the Plesk control panel used by shared hosting plans, because they are accustomed to it — there is a very small learning curve, making it ideal for first time users as well. The reseller plans run “Plesk Reseller Control Panel” which is known to be easier to use than WHMC to give a comparison. Also A2 Hosting provides free site transfers and one-click install SSL certificates (also free). Making it one of the best valued hosts in the industry. Any questions about Windows hosting? I’m most glad to get in touch! Notice.. WebHostWhat has a monetary relationship with A2 Hosting through their affiliate program which pays out commission from sales that are made after clicking some of the links on this page. It has no effect on your wallet, or my opinion about their products which are based on real research and experience. Thank you! Next HostGator SiteLock a Scam? Let me Explain in This Review!